My rating: 8/10. Retro style watch. Affordable timepiece. Hello, today I’m doing a Casio W-86-1VQES review. Yup, I’m slowly working my way through many of the most popular affordable watches available, and these retro Casio timepieces just seem to top the list. I hope you enjoy this Casio W-86-1VQES review below. 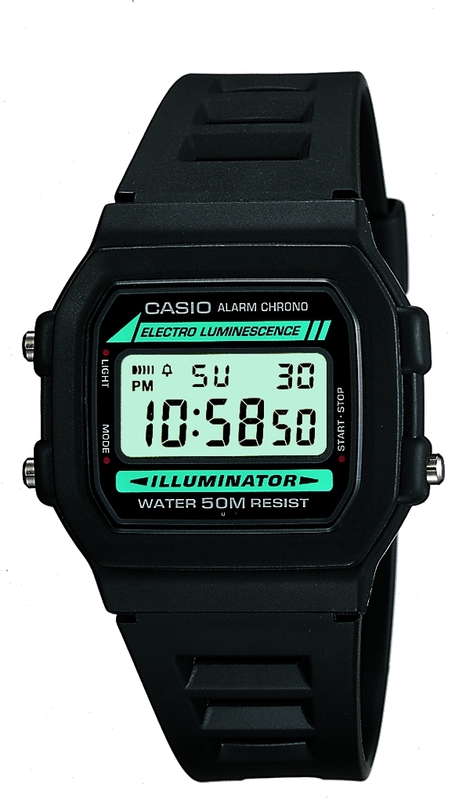 This is another best selling retro Casio watch. It has a high visibility clear digital display that features a electro luminescence backlight for easier reading in dim lit conditions. This rectangular design is typical of Casio’s older watches and lately many people have been opting for this retro style with a lot of Casio’s rectangular timepieces growing hugely in popularity. Being a basic Casio timepiece with a traditional style it’s no surprise to find that it has a acrylic window lens. Acrylic can scratch but it’s very easy to buff most of these out with the right technique. It’s also highly shatter resistant so that’s a good benefit. Powering this watch is a Japanese quartz movement. These are reliable and accurate with a very long battery life making them ideal for these retro Casio watches. A lot of these Casio watches have quite a small retro design. This model has a 34mm casing diameter with a 9mm thickness. So it’s quite slim with a smaller overall design that’s great for those of you who aren’t fans of these modern larger watches. The strap of the watch is made of a black rubber with a vented design. It fastens with a standard buckle style clasp that’s easy to operate too. The strap measures 21mm wide which is a decent size considering the other dimensions of the watch. Extra features of this digital Casio watch include a alarm, stopwatch, chronograph, and backlight. Everything you need for a handy affordable sports watch. This model actually has a pretty decent 50m water resistance rating. 50m or 5 bar makes this watch suitable for swimming, white water rafting, non-snorkeling water related work, and fishing. Band Rubber vented strap, standard length, 21mm width, buckle style clasp. Case Resin/plastic casing, sizing diameter: 34mm and thickness: 9mm. Dial Digital display. Acrylic window lens. Another great choice for those of you out there looking for a retro digital Casio timepiece. This 80s style timepiece has been a massive hit lately, like many of the other similar models available. It features the common useful features found on basic sports watches so it can also come in handy in that sense. Hope you enjoyed this Casio W-86-1VQES review. Find more watch reviews below.